Lice are 1/16 – inch (2mm) long, gray-colored, move quickly and are difficult to see. Nits are white eggs firmly attached to the hair shafts near the skin. Unlike dandruff or sand, nits cannot be shaken off the hair shafts. Nits are easier to see than lice because they are white in color and very numerous. Itching of the scalp is the main symptom. A scalp rash may be present. The back of the neck if the favorite area. Head lice can be treated at home. With careful treatment, all lice and nits (lice eggs) are usually killed. There are no lasting problems from having head lice and they do not carry any diseases. Head lice does not make your child feel sick. 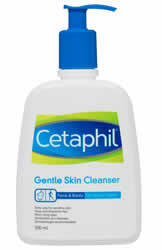 CETAPHIL CLEANSER: Cetaphil® Gentle Skin Cleanser, a widely sold, soap-less cleanser for people with sensitive skin. Cetaphil® Gentle Skin Cleanser can be purchased over the counter in the soap department at your local drug store. This method of treatment when used correctly, suffocates the lice and has been shown to clear up 96% of head lice infestations. Step 1: Apply the Cetaphil cleanser throughout the scalp to dry hair. Step 2: After all the hair is wet, wait 2 minutes for Cetaphil to soak in. Comb out as much excess cleanser as possible. Blow dry your child`s hair. It has to be thoroughly dry down to the scalp to suffocate the lice. Expect this to take 3 times longer than it would if the hair was just wet with water. The dried Cetaphil will smother the lice. Step: 3 Leave it on your child`s hair for at least 8 hours. In the morning, wash off the Cetaphil with a regular shampoo. To cure your child of lice, REPEAT this process twice in 1 and 2 weeks. 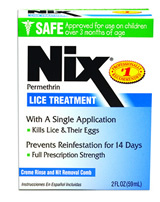 Step 1: Buy Nix anti-lice creme rinse (over-the-counter) and follow package directions. Step 2: First, wash the hair with a regular shampoo and towel dry it before using the anti-lice creme. Do NOT use a conditioner or creme rinse after shampooing (Reason: interferes with Nix). Step 3: Pour 2 ounces (full bottle) of Nix into damp hair. People with long hair may need to use 2 bottles. Work the creme into all the hair down to the roots. If necessary, add a little warm water to work up a lather. *Nix is safe above 2 months old. Step 4: Leave the shampoo on for a full 10 minutes or it won`t kill all the lice. Then rinse the hair thoroughly with water and dry it with a towel. 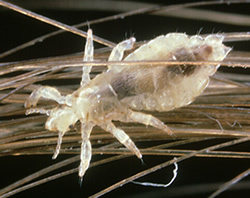 Lice are transmitted by close contact (they cannot jump or fly). Your child can return to day care or school after 1 treatment with the anti-lice shampoo. Check the heads of everyone else living in your home. If lice or nits are seen, or someone has the new onset of an itchy scalp rash, they also should be treated with anti-lice shampoo. Bedmates of children with lice should also be treated. If in doubt, have your child examined for lice. Re-emphasize not sharing combs and hats. Also notify the school nurse or child care center director so she can check other students in your child`s class/center. Lice that are off the body rarely cause reinfection. (Reason: lice can`t live for over 24 hours off the human body.) Just vacuum your child`s room. Soak hair brushes for 1 hour in a solution containing some anti-lice shampoo. Wash your child`s sheets, blankets, pillow cases, and any clothes worn in the past 2 days in hot water (130 F kills lice and nits). Items that can`t be washed (e.g., stuffed animals) should be set aside in sealed plastic bags for 2 weeks (the longest period that nits can survive). With 2 treatments, all lice and nits should be killed. A recurrence usually means another contact with an infected person or the shampoo wasn`t left on for 10 minutes, hair conditioner was used or the treatment wasn`t repeated in 9 days. There are no lasting problems from having lice and they do not carry other diseases.